nee brace migration is a common problem which can affect patient compliance and possibly even reduce the effectiveness of a device. The key to minimizing knee brace migration is to make sure that the device fits the patient’s anatomy as closely as possible. Therefore, we offer a novel knee brace which solves the incongruity problem between knee and orthotic, thus minimizing the constraint forces and the migration effects. 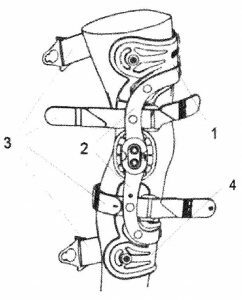 The primary segment (1) of the novel knee orthotic, which is mounted to the thigh, is fixed to the curved segment (2) in a re-relocatable manner. The linear relocation is realized by the application of guide pins, which slip into the according notches. That way we could prevent the migration of the knee brace along the patient’s leg, and also minimize the constraint forces and reduce the burden for the soft tissue.